FILE - A man walks past a sign prohibiting firearms and weapons inside the State Legislature in Montpelier, Vermont, March 13, 2018.
the latest state poised to tighten gun restrictions after last month's Florida school massacre. The Democrat-controlled state Senate approved the measure, S55, in a 17-13 vote, according to the online legislative record. The bill passed the state House of Representatives this week. The measure now goes to Republican Governor Phil Scott, who has shifted his stance and voiced support for some gun controls after the arrest in February of a Vermont teenager accused of threatening to shoot up a high school. The incident came two days after a former student killed 17 people at Marjory Stoneman Douglas High School in Parkland, Florida, on February 14. Scott's support for gun controls marked a sharp switch for a governor with a 93 percent approval rating from the National Rifle Association (NRA) gun rights advocacy group in an otherwise politically liberal, largely rural state with a passion for hunting and a reputation as a pro-gun stronghold. FILE - Vermont Gov. 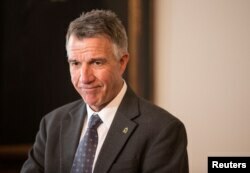 Phil Scott speaks to reporters in his offices at the State Legislature in Montpelier, March 13, 2018. Vermont Public Radio reported that the Senate would take up two more gun-related measures next week. Both are aimed at removing guns from homes in cases of domestic violence or when someone is at risk of imminent harm from firearms, it said. Gun control advocates say the turnaround in Vermont and as many as two dozen other states has been propelled in part by the groundswell of student-led lobbying efforts and protests calling for firearms restrictions. After the Parkland massacre, Florida's Republican-controlled legislature swiftly passed a bill that raised the age requirement and set a three-day waiting period for gun purchases and allowed the arming of some school personnel. The measure was signed into law by another Republican with strong NRA credentials, Governor Rick Scott.